Having completed two modular Lego buildings, I bought this book to see if I could pick up any solid ideas. 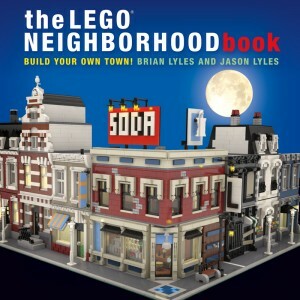 The Lego Neighborhood Book is a fairly comprehensive look into how to make your own buildings in the modular style. It lists the basic requirements… and the promptly tells you to ignore them if you want. After all, the idea is to build something the way you want it, not necessarily so that it fits with some commercially released sets. The book then gives some good suggestions on how to get inspiration, mostly by showing photos of architectural designs and making Lego versions. There are some solid tips for making your street come alive with benches, parking meters and other such stuff, and a big chapter on internal furnishings for every kind of room. However, the book expects some basic knowledge of advanced Lego building to figure out some constructions on your own, and it doesn’t go into details like LDU’s, the 5:6 proportions, angled builds or anything like that. More than half of the book is taken up by building instructions, and it feels a little strange to basically have paid for what (technically) comes for free in sets. The instructions give you a very detailed two-storied corner building, as well as a narrower 16×32 basic design which can be highly customized with your own front, with three separate variations given. The former, the Corner Drugstore, goes into more detail than a regular commercial set and ends up with a truly amazing build, but I’d assume that the parts count makes it expensive to put together. Also, making something by someone else’s instructions isn’t nearly as fun as coming up with one yourself. Det här inlägget postades i Böcker, Prylar och har märkts med etiketterna Lego, Lego Modular Buildings. Bokmärk permalänken.